That’s what genetic engineering advocates claim. But science (and a shocking number of developing-world suicides) debunk this myth. BIO, the Biotechnology Industry Organization, says that a genetically engineered crop improves insect resistance, enhances herbicide tolerance, and facilitates the use of more environmentally sustainable farming practices by generating higher crop yields with fewer inputs. They say it lowers the amount of agricultural chemicals required by crops; creates crops with enhanced nutrition profiles that solve vitamin and nutrient deficiencies; produces foods free of allergens and toxins such as mycotoxin; and improves food and crop oil content to help improve cardiovascular health. The problem is, these claims are false, or at least are not supported by factual evidence. GE crop yields are not consistently higher than non-GE crops, and genetic engineering can have devastating environmental, economic, and health consequences. GE soybeans do not produce increased yields at all, and GE corn has only marginally increased yield. Overall, corn and soybean yields have risen over the past fifteen years, but this is mainly because of traditional breeding or improvement in agricultural practices. More crop rotations, longer rotations, and a larger variety of crops are more eco-friendly and tend to reduce crop losses from pests and diseases, which in turn increases yields. Since 1987 there have been thousands of field trials for GE—and all this time, only Bt corn (corn that has been genetically altered to express the bacterial Bt toxin, which is poisonous to certain insect pests) has been shown to increase yield, but has only done so marginally. No GE crop has been found to enhance the intrinsic yield. This of course undermines the claim that GE “will feed the world.” All increases to date have been due to achievements in traditional breeding. The potential for GE to increase intrinsic yield in the future is unclear. Biotech companies are testing various experimental yield-enhancing genes called transgenes, which generally result in more complex genetic effects, some of which might even be too detrimental for commercialization. And if commercialized, the risk to humans and the environment is unknown, but based on what we know, is likely to be high. GE has generated only minimal gains in operational yield. Data show that GE herbicide-tolerant soybean and corn have demonstrated no increased operational yield, while Bt corn provides operational yield increase when those specific pest infestations are high, but no advantage when pest infestations are low. Since 1996, when Bt corn was first commercialized, it’s about a 0.2 to 0.3% increase per year. Bt, by the way, is a natural pesticide with low known toxicity, not a chemical pesticide. The danger of using Bt in this way is that resistant organisms may be created. In 2003, the World Bank and the UN initiated a global consultative process with sixty countries and some 400 scientists around the world about agriculture and its role in poverty alleviation. The 590-page report, also published in 2009, concluded that GE crops have no role to play in relieving poverty. Fifty-eight countries approved the report following its release, while only three—the USA, Canada, and Australia, all strongly supportive of GE crops—did not fully approve it because it failed to tout GE crops as the savior to the world food shortage problem. The report stressed that even if GMO crops were able to increase overall yield, the limited number of GMO crop varieties would not reduce food scarcity: crops have to be adapted to local conditions, be supported by local infrastructure, and be within the capacity of the local farmers to implement them. Moreover, the emphasis of some traits through genetic engineering could threaten biodiversity by limiting farmers’ options, forcing them to select from too few varieties. What developing countries need most is increased food production—yet according to the UCS report, several recent studies show that organic and low-external-input farming methods (i.e., using reduced amounts of fertilizer and pesticides) can improve yield by over 100% in those countries, along with greater health benefits. Farming of this sort is based on farmers’ knowledge of their environment as well as locally adapted crops. It helps poorer farmers especially, assuming they are not forced to be dependent on buying expensive, patented seeds from a handful of biotech companies. The cost of GE seeds in the context of the poverty of the developing world is a major consideration. Over 17,000 farmers in India committed suicide in 2009 alone—approximately one every 30 minutes—and those suicides have been blamed on Monsanto and GE seeds. Farmers went into debt to buy GE seeds, hoping for increased yield, and when those crops failed due to pest infestation, they were left more impoverished with no prospects for the future. Farmers were not told that the crops would require twice the amount of water, and the crops do not produce viable seeds—which means the farmers would have to keep purchasing new seeds. Many of the farmers made their suicides a symbolic act by drinking Monsanto’s pesticide. The rate of Indian farmer suicides began increasing after the introduction of Monsanto’s Bt cotton in 2002, and two-thirds of farmer suicides occur in five Indian states, which has come to be known as India’s “Suicide Belt.” Dr. Joseph Mercola witnessed the destruction of traditional Indian farmers firsthand. 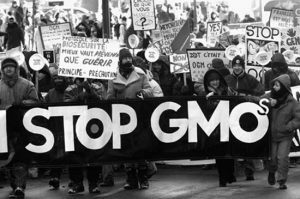 Besides its high price, GMO could put other farming systems—organic agriculture, seeds from international suppliers, etc.—in serious jeopardy through the poor segregation of crops and significant threat of cross-contamination, endangering the livelihood of those farmers as well. Furthermore, GMOs create global dependence, concentrating economic power in the hands of a few—those who own the patents on the seeds—stripping small farmers of their independence. In short, GE crops can be far more detrimental to developing countries than helpful. An important new (and as yet untitled) documentary film is in the process of being made. Its main aim is to raise awareness among Americans as to the problems caused by GE crops. It starts by focusing on the symbolic burning of seeds by poor Haitian farmers in defiance of Monsanto’s gift of 475 tons of hybrid corn and vegetable seeds to Haiti shortly after the devastating earthquake of January 2010. The filmmakers’ journey to Haiti to learn why hungry farmers would burn seeds leads to a trip across the US and other countries in search of answers—and an awakening of what has happened to our food in the US, what we are feeding our families, and what is at stake for the global food supply. As you might expect, the filmmakers discovered that GMOs are not labeled as such in the USA, and very little safety testing has been done on humans—or even animals. The funding for the film so far has come from the filmmakers’ own credit cards. To get it finished, the film needs more financial backing from people like you. We’ve set up a special donation page exclusively for the GMO film and every penny will go to the filmmakers. A generous donor has promised to match any pledges you might wish to make, so please be generous! The film, if released in time, could be instrumental in helping trigger much higher levels of awareness over California’s GMO labeling ballot initiative. If voted into law, it would make the labeling of GMOs mandatory, which in turn will likely create a domino effect in other states, and perhaps GMO labeling for the rest of the country. Very few companies will create two different labels for the same product. The question of labeling is completely unrelated to the question of whether GMO will feed the world. The right to know what goes into your body is a fundamental freedom and one we, in the US, have clearly let slip. GE crops, along with their patented transgenes, have in just 16 years contaminated the world. GE crops are forcing up the cost of their conventional counterparts, especially where their GM-free status needs to be guaranteed. Testing, and keeping supply lines uncontaminated, both cost money. In effect, we have allowed the polluter to avoid responsibility for contaminating farmlands, the natural environment, and a large part of the human and animal food chain. Isn’t it time the tables were turned? Mandatory GMO labeling is a good start. Developing countries will soon outstrip developed ones with more acreage cultivated to GE crops. Part of the reason for this is increasing resistance to their cultivation in developed countries. The biotech industry is desperate to use the poverty alleviation argument to remove barriers in developing countries, but the independent science suggests GE crops don’t hold the answer. GE crops demonstrably do not help starving people anywhere. In fact, the evidence indicates quite the opposite: they make their lives far, far worse. If mandatory labeling comes to the US, not only do we get to choose what we put in our bodies, but food producers would likely remove GMOs from the human food supply chain (as in Europe and most of the 50 countries that already have compulsory labeling). As a result, we—as consumers—would no longer have to bear the cost of keeping our food GMO-free. Bottom line: quite apart from the health risks of eating GMO, don’t believe the economic claims made on behalf of GMO seeds and food. These claims do not stand up to scrutiny. They are, in fact, false. Making false claims knowingly is fraud. The Federal Trade Commission is of course supposed to police and prevent commercial fraud. But the FTC, like the rest of the federal government, is strongly behind GMO.